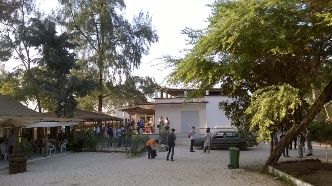 The Spring School is jointly organized by AIMS Senegal and the Goethe-University Frankfurt, and it is funded by the DAAD Germany within the project "Local and Nonlocal Effects in Geometric Variational Problems". In addition to participants from AIMS Senegal, up to 20 junior scientists are invited participate. The scientific program and meals will take place at the African Institute for Mathematical Sciences (AIMS) in Mbour, Senegal, situated approximately eighty kilometers south of Dakar at the Atlantic Coast. Accomodation will be arranged by AIMS in a nearby hotel (nightly rate around 60 €). Transport from the Airport Dakar to the hotels will be arranged by AIMS as well. The conference programm will include four minicourses given by the speakers listed above. Abstract: Free boundary problems are those described by PDE's that exhibit a priori unknown (free) interfaces or boundaries. In other words, there are two unknowns in these problems: the solution of a PDE, and a free boundary which determines the domain in which the PDE is satisfied. Such type of problems appear in Geometry, Physics, Probability, Biology, or Finance, and the study of solutions and free boundaries uses methods from PDE's, Calculus of Variations, and Geometric Measure Theory. The main mathematical challenge is to understand the regularity of free boundaries. The Stefan problem and the obstacle problem are the most classical and motivating examples in the study of free boundary problems. A milestone in this context is a classical paper of L. Caffarelli, in which he established for the first time the regularity of free boundaries in the obstacle problem, outside a certain set of singular points. This is one of the main results for which he got the Wolf Prize in 2012 and the Shaw Prize in 2018. The goal of this minicourse is to introduce these free boundary problems, explain the main known results in this context, and give an overview of the current research and open problems. Abstract: In this minicourse we will first discuss unique continuation properties for (fractional) Schrödinger equations and the resulting dual approximation properties. Here striking differences between local and nonlocal equations arise. Exploiting the flexibility of solutions to nonlocal Schrödinger equations, in the second part of the minicourse we will then address a nonlocal inverse problem, the fractional Calder\'on problem. Here one seeks to recover information on the potential of a Schrödinger equation through exterior measurements. The strong rigidity and the dual flexibility properties of nonlocal equations lead to surprisingly strong results. Abstract: In this course, I will describe a new point of view on on old subject: minimal surfaces with free boundary. After recalling briefly the general theory of harmonic maps, I will move on the regularity theory of fractional harmonic maps, which have been introduced by Da Lio and Riviere. Besides their analytical interests, that I will describe, they have also a geometric content: in some cases, the image by the map of the domain is minimal surface with free boundary. Using the latest developments in nonlocal equations, this offers a new point of view on the subject. I will describe several open problems and several projects under investigation. Abstract: The study of the nodal set, or more in general of level sets, is an important research topic for solutions to differential equations. Properties of the nodal sets are interesting in themselves, and often provide a useful tool in the study of properties of solutions. In this short course, we give an overview of classical and recent results regarding the main properties of the nodal set of solutions to linear elliptic equations: unique continuation, geometric structure, and measure estimates. Semilinear equations with superlinear, sublinear, or even singular nonlinearities will be considered as well. Particular emphasis will be given to the role plyed by monoticity formulae in this field of research. For participants from Germany, DAAD offers up to 11 grants to cover travel and accomodation expenses up to 925 € (625 € for travel expenses, up to 300 € for the hotel) according to the DAAD regulations. 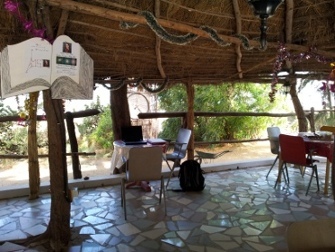 Similarly, for other participants, a small number of grants are funded by the endowed chair in “Mathematics and its Applications” at AIMS, Senegal. Please let us know within the form whether you wish to apply for one of these grants. Every applicant will be notified until December 1st, 2018 whether he/she is invited to participate. *Your data will be stored by us for up to three years for the purpose of organization, communication and documentation. Regarding the data policies of google, please see the information given below the form. If you prefer not to use the form and to send us your data directly (plain text ! ), you can do this by email to habash@math.uni-frankfurt.de.